Its finally dawned on me; Go Organic! Stop using poison on the land if you don’t want to poison the land! It’s obvious to me now after reading Atina Diffley’s award winning memoir Turn Here Sweet Corn. The organic approach is the embodiment of the Hippocratic Oath; do no harm. Atina’s love story with the land opened my eyes to the potential of applying organic farming techniques to our work at the Scuppernong Springs Nature Preserve. Atina and her husband, Martin Diffley, (Organic Farming Works LLC) are pioneers in the organic farming movement in Minnesota, their efforts culminating in a “Kale versus Koch, Soil versus Oil” pipeline smackdown where they stood up to the Minnesota Pipe Line Company, which is operated by the Koch Pipeline Company, a subsidiary of Koch Industries, and prevented a pipeline corridor from being routed right through their Gardens of Eagan Organic Farm. They saved their land AND Atina contributed to the preservation of other organic farms via the creation of the Organic Appendix to the Agricultural Impact Mitigation Plan that all pipeline and transmission line companies must comply with if they succeed in routing their lines across organic farmland. Atina explains that it’s all about relationships: people to the land, plants to the soil and people meeting each others needs in community. I’m inspired to only employ non-toxic ways to nurture The Springs back to health a la organic farming techniques; I want the Scuppernong Springs Nature Trail to be “Certified Organic”. Atina and Martin helped me realize the importance of building and protecting the soil and, after reviewing the research on the residual effects of Milestone and Transline and their potential to leech into groundwater, I concluded that I could no longer use them in any context at The Springs. Jason Dare began turning me in this direction and now I’m fully committed. The only exception to the ban on poison that I will make is to use Tahoe/Triclopyr on cut buckthorn stumps (painting, not spraying), and hopefully, we’ll find a natural alternative to that as well. I claimed to want to garden the sand prairie. What was I thinking? Would you use poison in your garden? In the past two years I had acquired no less than 7 different poisons: Aquaneat/glyphosate, Habitat/imazapyr, Bullzeye/glyphosate, Milestone/aminopryalid, Transline/clopyralid, Tordon/picloram and Tahoe/triclopyr, all of which I have returned to the DNR except the Tahoe stump killer. Martin Diffley summed it up pretty well: “If we don’t change direction, we’re going to end up where we’ve been going.”, and my approach was slowly poisoning The Springs. One story from Turn Here Sweet Corn that really impressed me was how they handled a 9 acre field of quack grass. Despite being pressed by demand for their produce to get this land into production, Martin recommended they wait for just the right combination of dry and hot weather. When it finally arrived, they used a 930 Case tractor fitted with a Vibra Shank field digger to “rake” the weeds, exposing the roots to the blazing sun, repeating the process over 6 weeks until the quack quit. 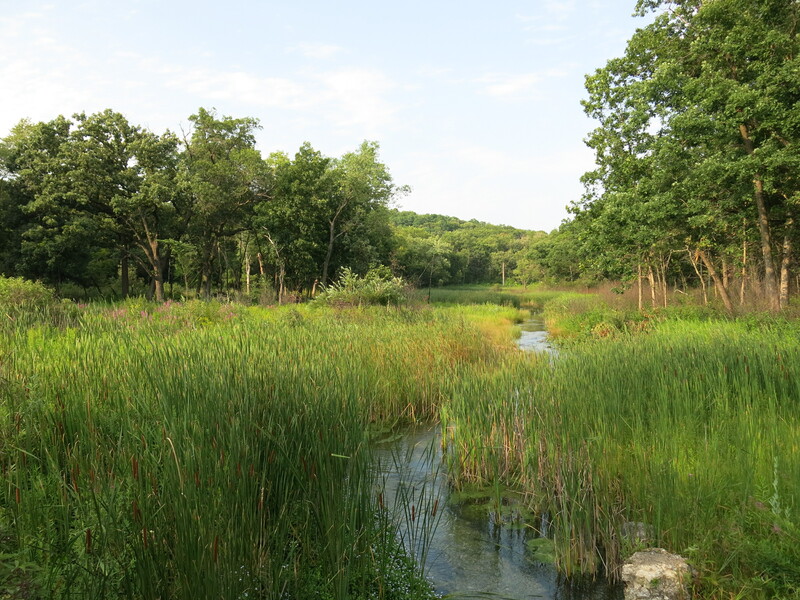 That got me thinking about the phragmites and cattails in the valley along the Scuppernong River headwaters; maybe we could do the same thing there! Like Einstein said, “We can’t solve problems by using the same kind of thinking we used when we created them.”, and now that my organic consciousness has been awakened, I’m seeing new, non-toxic, solutions. Yesterday, Pati and I met with DNR Trail Boss Don Dane to walk the trails and review our approach to restoring the Scuppernong Springs Nature Preserve, and we we joined by John and Sue Hrobar. I’m prone to excited bursts of non-stop chatter and, true to form, I began by telling Don that I wanted to go organic. He was totally on board with this and promised to help us achieve that goal. 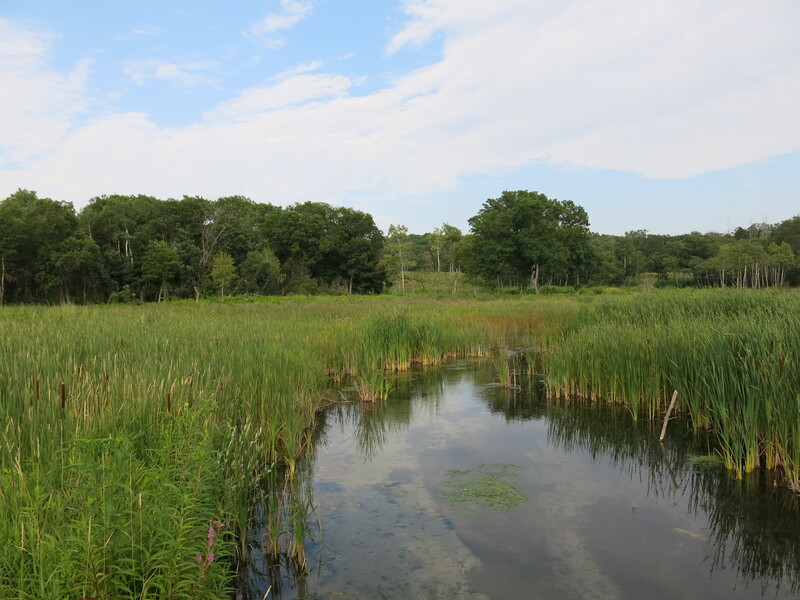 The first area we reviewed was the valley along the headwaters of the Scuppernong River that is dominated by phragmites and cattails. I told him Martin’s story and we talked about mowing and raking and Don suggested that, in the short term, I get a hedge cutter and simply cut the seed heads off the phragmites and cattails at a height that will leave the myriad of other plants that have emerged in the “understory” since the burn undisturbed. 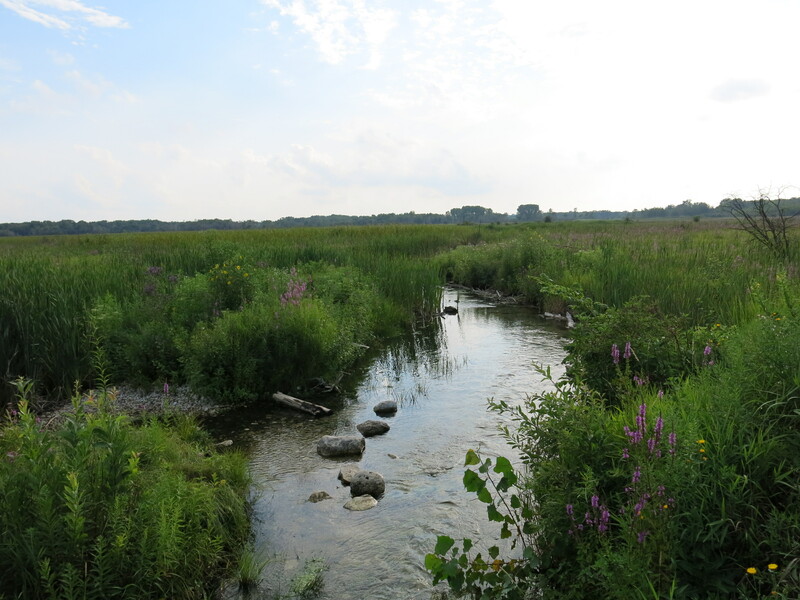 This will drain the energy from the phragmites and cattails while allowing the native plants to compete and, combined with fire, we hope this will be an effective strategy. One of my big concerns is all of the buckthorn seedlings and resprouts that have emerged since we cleared the mature buckthorn. I explained this to Jason Dare and he suggested I rely on fire to control them. I talked to Don about this and he is committed to burning the scuppernong every 2-3 years. That was the assurance I needed! 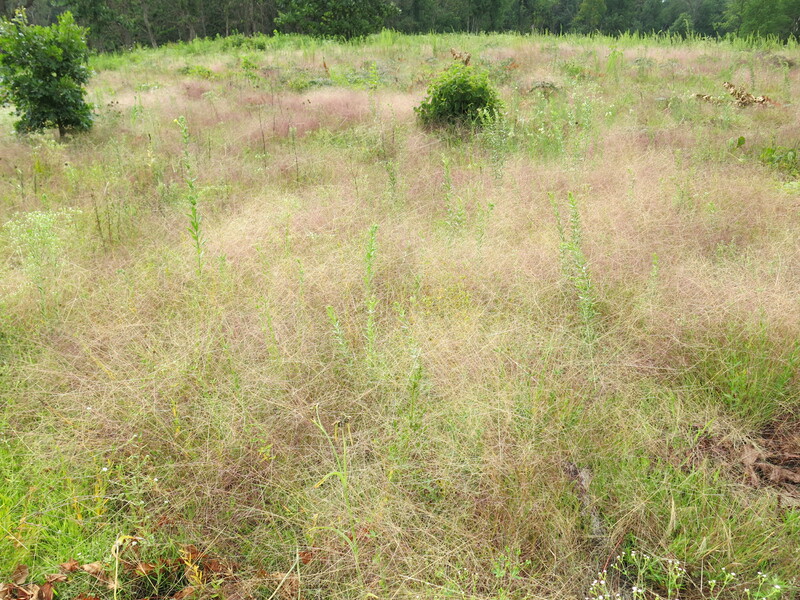 In the meantime, Don suggested brush cutting areas where the resprouts are thick to better enable fire to move through. We talked about the north end of the trail, buckthorn alley, and agreed that I should focus on clearing the buckthorn there to help facilitate getting a hot fire through this part of the Nature Preserve; the DNR has never been able to burn this area. Here is a native swamp thistle Don pointed out by the hatching house springs. 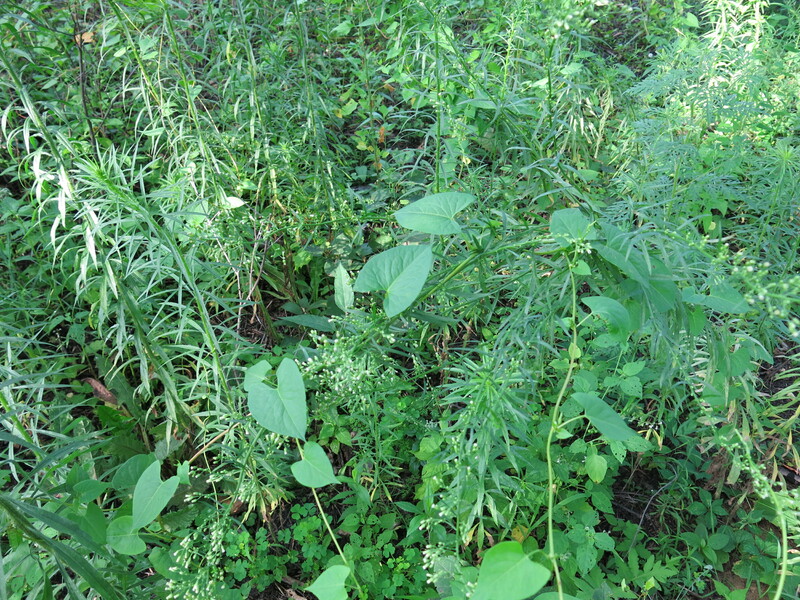 Oriental bittersweet and hedge bindweed (shown below) are concerning and we discussed brush cutting and pulling them. 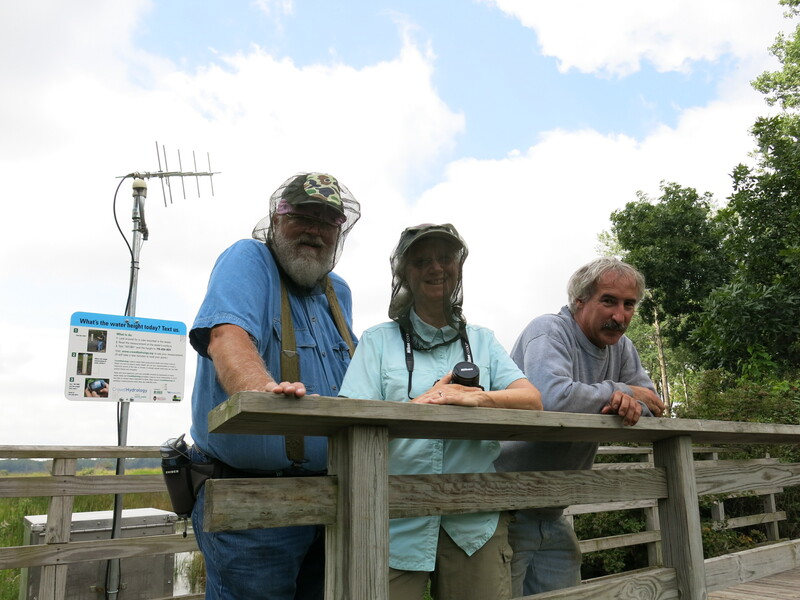 John, Sue and Don at the gaging station bridge. I’m hoping that more volunteers will step forward if they know we going organic. Pati and I spent the afternoon pulling spotted knapweed on the sand prairie, which Don said they also refer to as a cliff messenger prairie. The purple lovegrass is thriving! 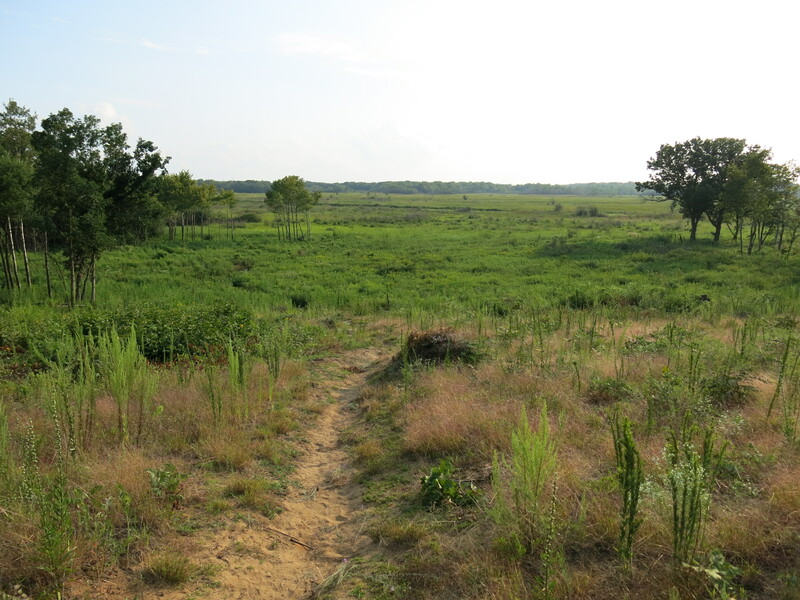 Here is a view of the sand prairie. 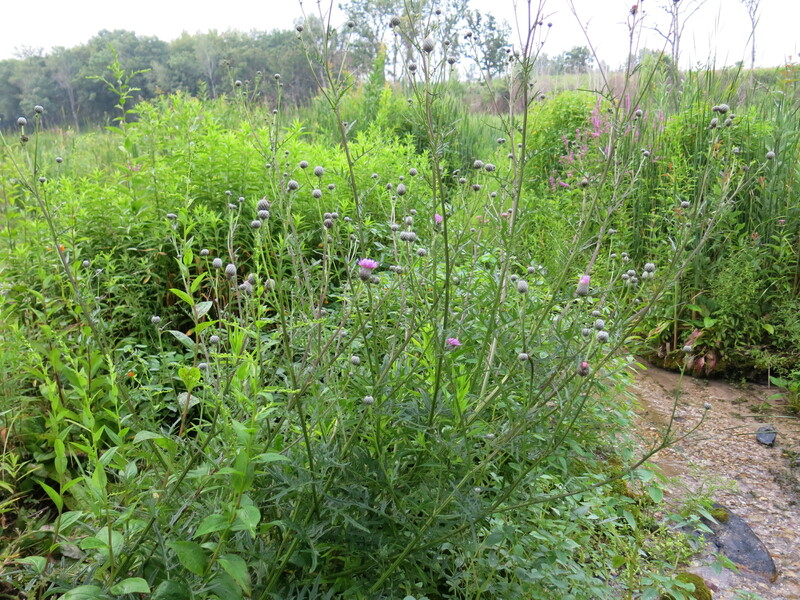 I felt totally calm and at peace with my hands in the sandy soil pulling spotted knapweed all afternoon. The rough blazing star and golden rod are set to flower and I’m really glad I took the time to clear the prairie with the brush cutter rather than simply mowing it. Here are a few parting shots from the marl pit and gaging station bridges. This entry was posted in Buckthorn, Buckthorn Alley, prescribed burn, Sand Prairie, Scuppernong River, Spotted knapweed and tagged Buckthorn, Kettle Moraine State Forest, Kettle Moraine Trails, Nature, Phragmites, prescribed burn, Quack Grass, Scuppernong River, Scuppernong Springs, SouthEastern Wisconsin Hiking Trails, Spotted Knapweed by paulmozina. Bookmark the permalink. I am on board with organic. It works in my garden. It should work at the Springs. Let us figure out strategies that work the land rather than kill it. Thanks Rich. Atina sent me this link to a natural, non-toxic herbicide http://alldownherbicide.com/, which uses Acetic acid as the active ingredient. I talked to Don Dane about it and he is going to pick up some based on the same ingredient but from a different vendor. I’m looking forward to the organic transformation at the Springs. So happy you see the value in this Paul and are willing to do the grammar, apply the logic, and create rhetoric for a new way to restore large landscapes, the way nature intended. Hi Pati. Thanks for reading “Turn Here Sweet Corn” to me on our recent canoe trip to Upper Nashotah Lake; brilliant intuition!